Arab leaders, who court international sympathy by portraying their people as displaced victims, are refusing to help Syrian refugees. Palestinian leaders, who court international sympathy by portraying their people as displaced victims of Israel, are refusing to help tens of thousands of their brethren who have been displaced from homes and refugee camps as a result of the civil war plaguing the neighboring country of Syria. 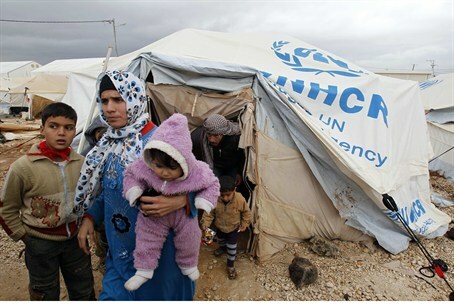 Leaders of both Hamas and the Palestinian Authority have rebuffed requests by the United Nations Relief and Works Agency's (UNRWA) for assistance in stemming the humanitarian crisis in Syria, causing 150,000 Syrian citizens who claim “Palestinian” origins, to remain homeless and “facing freezing temperatures, missiles, bombs and food shortages,” as Paul Alster of Fox News reports. “[The UNRWA is] the only one taking care of the refugees in Syria, but that’s not just now," Dr. Benedetta Berti, an international policy and security consultant and expert on Middle East affairs, told FoxNews.com. "The Palestinians have always deferred to the international community to provide for them (the refugees) so this is just business as usual." Hamas Prime Minister Ismael Haniyeh believes that seeking refuge for Palestinians trapped in Syria could undermine his argument for a “Palestinian right of return” to what they deem “occupied Palestine,” or, more accurately, the Jewish homeland in the State of Israel. The same rationale appears be one of the contributing factors to a similar lack of action from Mahmoud Abbas and his Palestinian Authority. “The apparent unwillingness to lift a finger behind the scenes for fellow Palestinians in need is at odds with the Palestinians' public stance,” Fox News reports, noting that Palestinian Ambassador to the U.N. Riyad Mansour, in a Dec. 19, 2012, letter to the UN Security Council, urged the world to help the Syrian refugees. “The growing impact of this crisis on their (the refugees) human security and on the stability of the refugee camps has become of grave concern and compels me, on behalf of the Palestinian leadership, to call for the urgent attention of the international community to this matter,” Mansour wrote. Israel, on the other hand, has offered to send humanitarian aid to the Syrian people, but has, thus far, been rebuffed. According to new figures released by the United Nations, at least 60,000 people have been killed in Syria's civil war, with monthly casualty figures steadily increasing since the conflict began almost two years ago.